Masjid Quba is the second largest and prominent mosque in Madinah after the Prophet’s mosque. It is situated in the South of Madinah. The main importance of this mosque in Islamic history is that it was the first mosque built in the initial year of the Islamic calendar. Masjid Quba is an exclusive site whose white building can be obviously seen from a distance. It receives worshipers and visitors from all over the world for all the 12 months, but the numbers increase in the holy month of Ramadan. Large gatherings can be seen within the mosque’s boundaries especially in the early morning. Sapphire Hamwi, a writer, says in his book that Masjid Quba was initially surrounded by a village which was named after it. It was occupied by the tribe of Bani Amr bin Awf. On his way to Madinah, the Prophet Muhammad (peace be upon him) went to the home of Bani Amr Bin Awf and made this mosque which he named Quba. 1- The mosque had a well in its premises which belonged to Abu Ayyub Al-Ansari. It became a sacred place as the Prophet’s she-camel first knelt there to take a long drought of water after the Prophet’s journey. 3- Ibn Umar narrated that the Prophet used to go to Masjid Quba occasionally when out for a walk, or sometimes riding over there and then prays two Rakahs. 4- The first renovation was made by the third Caliph Uthman ibn Affan. 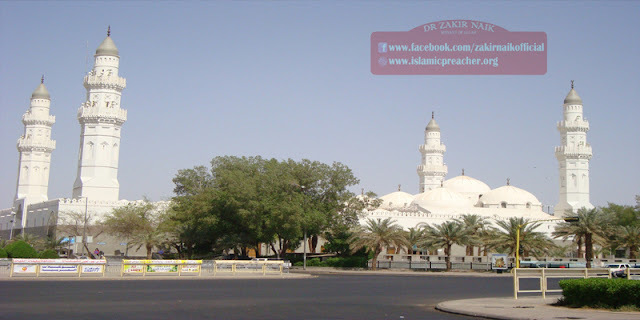 The first minaret of the masjid was built by Caliph Omar bin Abdul Aziz. Abu Yali Al-Husaini renovated the mosque again in 435 A.H. He constructed a prayer place known as the “Mihrab”. 5- Kamal Al-Din Al-Isfahani also made some additions to the mosque in the year 555 A.H. Consecutive rebuilding of the mosque took place in the years 671, 733, 840, 881 AH, and the most recent changes were made in the period of Sultan Abdul Majid in the year 1245 AH during the time of the Ottoman Empire. 6- Today’s Masjid Quba is equipped with the most modern services while maintaining its Islamic identity. The mosque can accommodate about more than 20 thousand worshipers at one time. 7- There are 7 major entrances and 12 supplementary ones. The mosque is cooled by three middle units, each with a capability of one million and eighty thousand cooling units. The northern section is reserved for women worshipers. The masjid now has 4 minarets and 56 domes connected to a house of Imams and muezzins, a library, a place for the guards in a part of 112 sq. meters, and a marketable center with 12 shops covering an area of 450 sq. meters. The mosque has 64 toilets for gents and 32 toilets for ladies, and 42 units for washing.